Lago Iseo at the foot of the high valley walls. 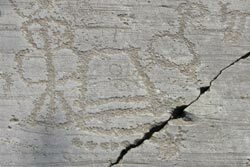 Since humans first inhabited the Camonica Valley (Valcamonica) in Northern Italy, they have left traces of their culture, their thoughts, and their everyday activities on the rocky surfaces around them. This small, otherwise unremarkable Alpine valley contains the largest collection of prehistoric rock art in Europe. Ancient artists first recorded the images in their minds here 10,000 years ago, and continued to do so through the time of the Roman conquest of the valley in 16 bce, leaving traces of the development of their (and our) culture throughout this period. Valcamonica is on the very southern fringe of the Italian Alps, on the road to nowhere. To the north, the valley ends blindly, without ready access to any of the main Alp’s crossing routes. Movement east and west is inhibited by high valley walls. To its south, is Lago Iseo, the smallest lake in the Italian Lake District. The shores of this small moraine lake lie at the base of the high valley walls, obstructing the path to the fertile and heavily populated Po Valley like a cork in a bottle. It is likely this isolation permitted uninterrupted development and accumulation of the rock imagery for so many millennia. Indeed, to date more than 300,000 images have been discovered in Valcamonica, far more than in any other Alpine region. 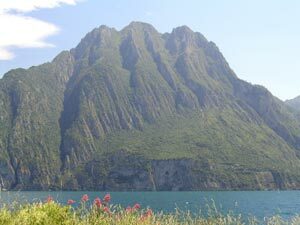 During the last Ice Age (about 25,000 years ago) Valcamonica was uninhabitable, for great sheets of ice with origins higher in the Alps ground their way down through the valley to the great plain of the Po River. In the absence of humans however, the ice was preparing the valley by polishing the sandstone surfaces that would later become the canvas for their art. This abrasive action created great slabs of smooth, polished stone that were sometimes tabletop flat, sometimes gently curved like a circus mirror, and sometimes deeply carved like the detail on the banister of a grand staircase. It is on these smooth expanses that our ancestors first began recording their thoughts 10 millennia ago. 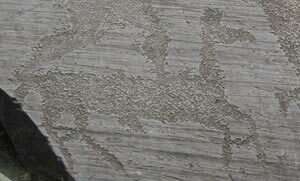 Beginning 8,000 to 10,000 years ago, the first images were engraved by the hunter-gatherers who followed their prey into the Alpine valleys during the great climate change at the end of the Ice Age. Then, elk and deer were plentiful, and they were frequently depicted. Scene of praying people from the Neolithic Age. About 5,500 bce, life in the Alpine valleys changed dramatically with the introduction of farming and animal husbandry. At the beginning of this Neolithic period, the depiction of elk suddenly disappears and the frequency of deer depictions drop dramatically, both changes probably are associated with the human induced changes in the habitat. New images of domestic animals and farming activities, like plowing, suddenly appear. Spiritually oriented scenes, with groups of praying people or images of other ceremonies make their first appearance. The world changed forever when humans first learned to smelt copper from copper ore, probably as an extension of their evolving abilities to fire pottery. This miraculous advance reached the Alpine valleys around 3500 bce and not only transformed the local culture but their art as well. Previously, weapons were rarely shown in their art, but now they became the most commonly represented object. The artists were fascinated with copper weapons, especially daggers and axes. The images often are not just of one weapon, but multiple identical daggers or axes drawn along side each other, likely by the same artisans. Sometimes individuals are shown with multiple weapons, probably reflecting a new worrier class in society. Upright loom from the Bronze Age. This fascination with weapons did not end with the onset of the Bronze Age at approximately 2500 bce. The art now showed a perfusion of weapons, from spears and swords, to shields and daggers. Additionally, images not seen before and related to their new way of life, like upright looms and new farm animals (horse and ox), make an appearance. 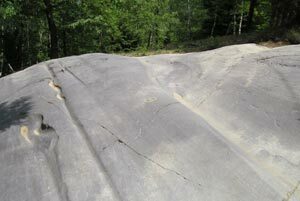 From this period there is even a huge 6’ x 13’ map on a single large stone that overlooks the valley. It appears to show Valcamonica in detail and is divided into various farmer’s fields connected by pathways or irrigation ditches. It is indeed a graphic representation of life in the valley 4000 years ago. The Iron Age came to the Alpine valleys about 1000 bce from the Etruscan civilization to the south. Not only did this contact bring a new, stronger metal, but new ideas as well. Again, these changes were reflected in their art. Weapons again predominate, but there is a profusion of images related to their new daily activities, including scenes of iron working, images of their houses and iron shovels. 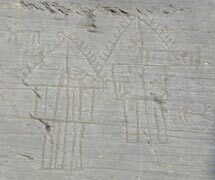 In fact, the majority of the art in the Valcamonica is from to the Iron Age. 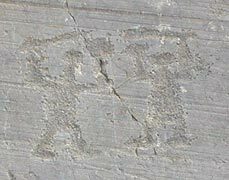 A few hundred years before the indigenous people’s conquest by the Roman legions, writing began to appear, which was probably acquired from the Etruscans. Then, suddenly, no further images are created. This change is associated with the Roman conquest and probably signifies a disruption of the culture of these secluded valley people. Indeed, Roman style settlements, and their art then predominate in the region. The ancient rock art, however survived, giving us a glimpse into10,000 years of history of this remote valley. 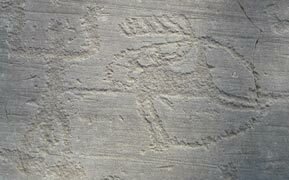 When I first examined the carvings, I was impressed with how difficult they were to discern. At first they were hardly noticeable, and only after seeing many images could I begin to pick them out readily. It’s like training your eye to pick out the constellations in the sky, or finding the seashore in dense fog. At first, you can’t imagine what others are seeing, and then it becomes obvious. 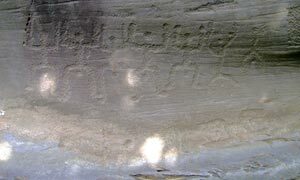 Horse: Images are chipped, not scratched into the rock. The images are chipped, not scratched into the surface. 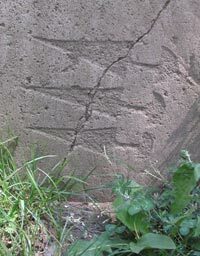 Initially the chipping was done with a stone. Later, a stone was held against the rocky surface and struck with another stone, much like a hammer and chisel. In this way more precise carvings were possible. Later still, actual metal chisels were utilized. The profusion of images is confusing. Pictures drawn at different times overlap, and the carving is sometimes very superficial. It helps to know that archeologists have discovered both the pigments and the tools used to paint these images, making it clear how the artists emphasized the symbols important to them. Initially I was struck by how childish the drawings appeared to me, as this stick-figure like art usually lacks perspective and a sense of motion. But I was reminded of the difference between Byzantine art and Roman art. 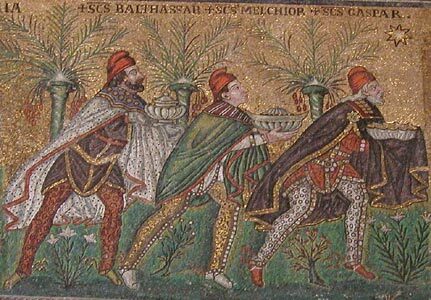 Byzantine art looks childish to my eye too. 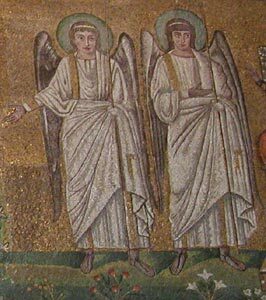 In Byzantine Art, people are usually shown frontally, in rigid poses. There is no perspective, or suggestion of motion. But their art is very symbolic, without the confusing elements of realism to mislead you about what is important in the depictions. Roman art, on the other hand, is realistic, with more pleasing forms, and the suggestion of motion. Roman art is pleasant to look at even if you don’t understand the symbolism, much like the art most of us see in our everyday life. The difference between Byzantine and Roman art is akin to the difference between the symbolism of Dali and realism of Monet. The art of Valcamonica makes more sense to me when I think of it as sophisticated symbolism without the encumbrances of realism. Look at this image of a wagon, drawn 4000 ago. The perspective is very distorted, making it look childish to me. Note however, that the features that make it so recognizable as a wagon are clearly drawn. The wheels are obvious. You can tell how the animals are yoked to the wagon. You can see how the wagon is constructed and even that the front wheels are wider apart than the back wheels, exactly as wagons were made in this valley up through modern times. It is a fascinating experience to watch a culture evolve over time; to watch their priorities change, and their new technologies emerge. 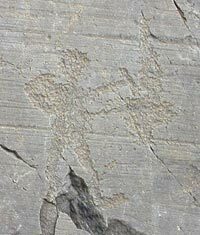 The rock art of Valcamonica is especially significant as it allows us to observe changes that occurred in an isolated culture over an extraordinarily long period of time.